We know how hard it can be to find high-quality screen-free activities to enjoy as a family. But we also know how rewarding it is when we do! That’s why we have family game night. The competitive or cooperative aspects of board games help us cultivate much-needed quality time together. Our favorite board games include a healthy mix of strategic and cooperative play. Here’s a list of what we think are the top strategy board games for families. We hope it will inspire some competitive fun for your family—and maybe even divert some of that spiteful sibling rivalry into something more productive. 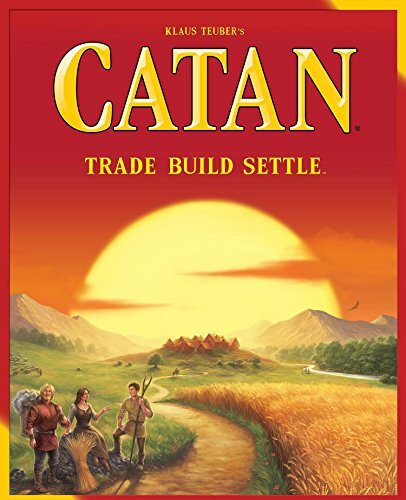 The Settlers of Catan is one of the most popular strategy board games available today! Imagine you’re a seafaring adventurer in search of new lands and after a long arduous voyage, your ship has finally landed on the coast of an uncharted island, Catan! But you’re not the only discoverer. 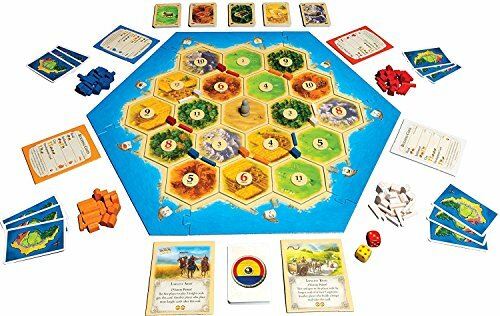 Other fearless seafarers have also reached the shores of Catan. Now the race to settle the island is on! In the game, players fight to be the dominant force on the island by building settlements, cities, and roads. With each turn, dice are rolled to determine what resources the island produces. Players collect these resources via cards- wood, grain, brick, sheep, or stone and use them to build up their civilizations. The goal is to be the first to earn 10 victory points and win the game. What we like best about Catan is, it has a good mix of strategy and luck. Also, the reply value for the game is really high because of the individual hexagon pieces used to create the land and sea. The pieces can be set differently every time so the island can be different every time you play! Ticket to Ride can be learned in under 15 minutes. But don’t be fooled, this game provides players with intense strategic and tactical decisions every turn. All aboard! 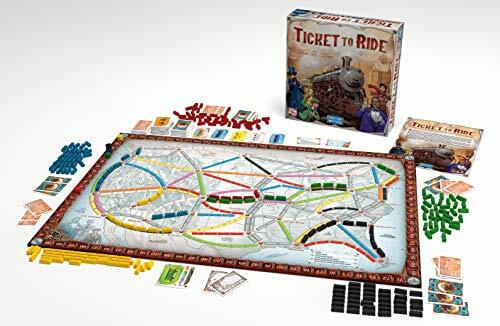 Ticket to Ride is a cross-country train adventure where players collect and play matching train cards to lay claim to railway routes connecting cities throughout North America. The more lengthy the route the more points you earn. Additional points are earned by those who fulfill Destination Tickets – goal cards that connect distant cities; and to the player who builds the longest continuous route. 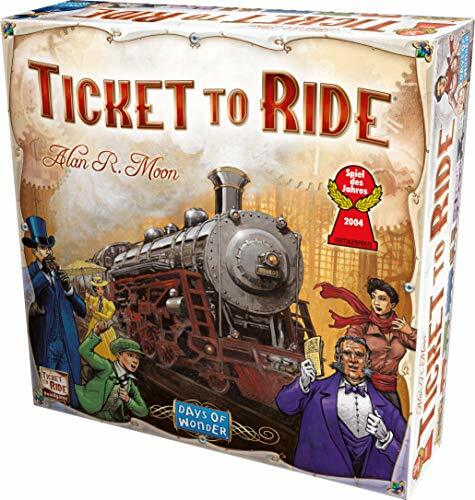 What we love about Ticket to Ride (read the full review here) is it’s challenging, fun, and easy to learn and play. It has high replay value as players must make a variety of strategic and tactical choices throughout the game. Plus, there are a bunch of add-on expansion packs and stand-alone spin-offs available as well! 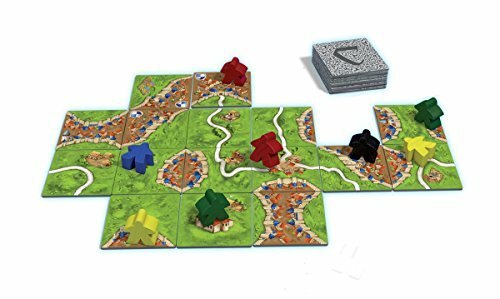 Carcassonne is a tile-laying game in which players shape the landscape of a medieval fortress city one tile at a time. Players choose from tiles that depict, roads, cities, fields, and monasteries. Each tile placed, creates an ever-expanding board on which players can add their followers (called “meeples”). Players score points by having “meeples” on features as they’re completed. The player who makes the most strategic placements of tiles and meeples will score the most points and win the game. What we love about Carcassonne is it’s quick and easy to play. It won’t overwhelm players with complexity, but it’s fun and challenging enough to keep 7 to 70-year-olds engaged! 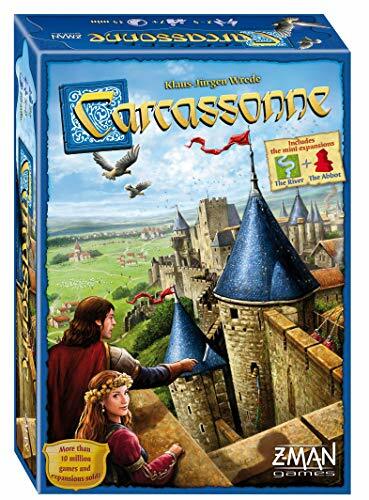 Carcassonne has a variety of expansions that bring in new game elements and even more tiles. There’d be over 300 if you bought them all! 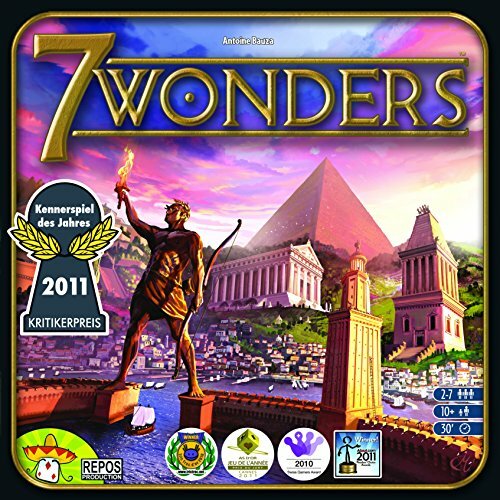 In 7 Wonders each player is a leader of one of the seven great cities of the Ancient World. You have the ability to build one of the Seven Wonders while gathering resources, making scientific discoveries, building commercial routes, and asserting your military power. A game takes place over three Ages, each Age uses one of the games three card decks. These Ages are played simultaneously, with each player having the opportunity to play 6 cards per Age to develop his or her city and build their Wonder. At the end of each Age, players compare military victories with the two neighboring cities (the players on their left and right). When the third Age ends, players count their victory points and the player with the most points wins the game. What we love about 7 Wonders is it’s a card drafting game. “Pick and pass” is one of our absolute favorite mechanics in tabletop gaming. We love the speed and excitement that playing simultaneously creates. In Azul , players, “artisans”, compete for the job of decorating the walls of the Royal Palace of Evora. The most clever of artisans plan ahead to maximize the beauty of their work while ensuring no supplies are wasted in the process. In the game, players take turns drafting colored tiles to their player board. They earn points based on how they’ve organized their tiles to decorate the palace. Extra points are scored for specific patterns and completing sets; wasted supplies lower player’s scores. The artisan with the most points at the end of the game wins. In the beginning, you might be too focused on your own gameplay, but you’ll learn quickly that it’s really important to check the progress of other players as well. 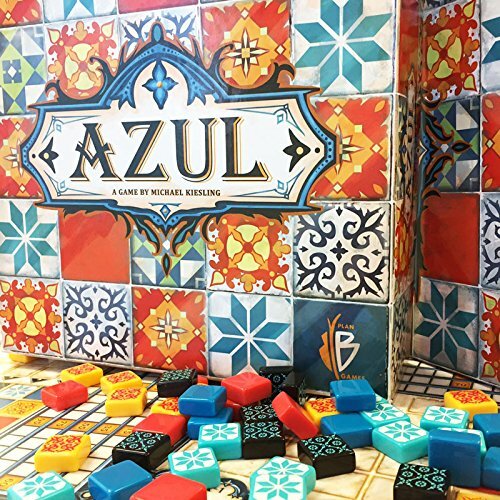 What we love about Azul is the high quality of the game components, they’re durable and really beautiful! Also, it ranks high for replayability and the game changes significantly depending on the number of players which is really cool. 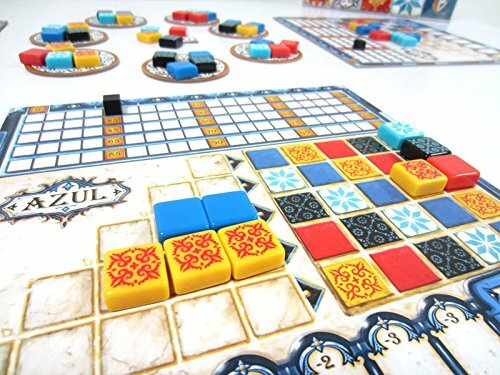 Azul is really different from a lot of games we play and we love that too. These are our top 5 favorite strategic board games at the moment. We’re always trying out new and different games at board game cafes. If any of these sound like fun for your family, great! If you’re not sure, give one or all a try at a board game cafe in your city. They’re a great place to have fun and connect with kids. Ticket to Ride Review-Toot, Toot, All Aboard!